A few prominent researchers have published articles about the organization of the Dutch East India Company (VOC), its administration and its archives. These articles provide important background information that is crucial for understanding the current archives at the National Archives of Indonesia, the Netherlands and other countries. The articles were published in the inventory by Brill in 2007. Of all the trading companies of the seventeenth and eighteenth centuries, the Dutch United East India Company (Verenigde Oostindische Compagnie or VOC), which was created in 1602, was indubitably the most success ful. Soon after its incorporation the VOC succeeded in firmly forcing back the Portuguese, who had established their commercial empire in Asia a century earlier, and pretty well eliminating them as competitors in the trade between Europe and Asia. The principal competitor of the VOC, the English East India Company (EIC), which had been founded in London in 1600, initially lacked the financial capacity, the organizational ability and governmental support to offer the Dutch Company any real threat. It was only at the end of the seventeenth century that the EIC developed into a potent rival worthy of its steel, which would cut the ground from under the feet of the VOC in various regions in the course of the eighteenth century. None the less, until the end of its existence as a trading company in 1800, the VOC remained the largest of the Asiatic companies. A number of factors which had a bearing on the rapid growth of the Dutch Company can be singled out. 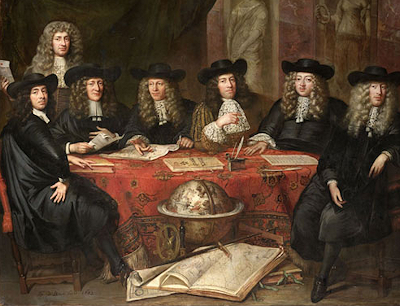 To begin with, the capital affluence available in the Dutch Republic provided the VOC with a substantial head start. By means of this the VOC was able to finance the costly military operations which were necessary to win it the world monopoly on fine spices. The conquest of the Banda Archipelago in 1622 gave the Company the monopoly on nutmeg and mace. It took longer to achieve the monopoly in cloves. By extirpating the clove trees on various islands in the Moluccas, the VOC succeeded in concentrating the cultivation of this crop in Ambon. 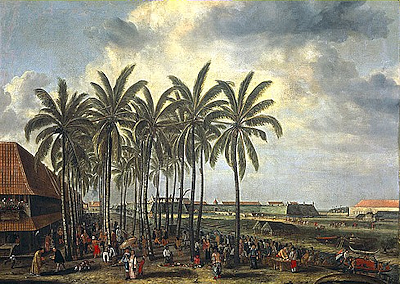 The capture of Makassar in 1667 meant that the last harbour where European and Asian merchants could purchase ‘contraband’ – that is to say traded outside the VOC – cloves had fallen into the hands of the Company. The monopoly on the trade in cinnamon was obtained by ousting the Portuguese from Ceylon. This took place in two stages: between 1637 and 1642 and from 1654 to 1658. Little is known about the fortunes of the archives in the era of the High Government. They were kept in Batavia Castle, the seat of the High Government and for a long time the residence of the Governors-General. 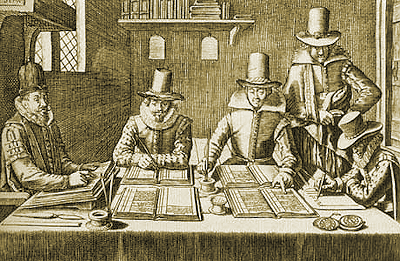 As the result of various wars almost nothing at all survives of the pre-1620 documents.1 On 29 July 1641, The High Government passed a resolution decreeing that all the old papers which were present in a locked Portuguese chest in the office of the Governor-General be ‘visited’ (exam ined) by a committee led by Pensionary J. Maetsuycker. Responsibility for the archive rested with the Chief Clerk of the General Secretariat. After ‘flaws and imperfections’ had been ascertained, in 1735 this responsibility was handed over to two archivists, the Merchant Gerardus Kluysenaar and Assistant Carel Anthony le Vasseur de Rocques.2 They were ordered to compare those lists which had already been compiled with the actual state of affairs. In 1739 the archive cupboards and the rooms in which they stood were filled to overflowing and a former warehouse was cleared to serve as the archive room.3 By 1768, this room was also brimful and it was decided to destroy the duplicates (the minute letters to the branch offices, the daily index on the minutes, the enclosures and so forth). In 1770 an inventory of all the archive documents was compiled, and while this was being done, a record was made of all the documents ‘damaged by white ants and other vermin’ which could be destroyed.5 In the course of the eighteenth century the work of the General Secretariat increased to such an extent that the Chief Clerk to the High Government submitted a remonstrance containing a request asking that the number of scribes (then around thirty-four) in the General Secretary be increased. 4. The Court of Justice (1620-1809). In Section III attention shifts to the urban administrative bodies in Batavia. There were various urban boards which performed their duties taking their counterparts in the larger Dutch cities as their example. In the archives these bodies are usually referred to as colleges.